The Galindestellung is built in the same line as the Masurische Grenzstellung and follows the German-Soviet pact border which divided Poland after the war of 1939. Contrary to the above mentioned line there are less types from the 100 series because it was built in 1940. The Festung Pioniere chose to use new types from the 500 series here. Due to the scarce steel parts most entrance doors were small 1.1m ones (15P7, 433P01, 446P01) and the gasdoors were usally the tiny 59P8 (1.7x0.6m) doors instead of the regular 19P7 (1.7x0.8m) doors. The MG casemate 514 is quite rare and four remaining examples can be found here of which the one at Turośl (Góra Dyliki) has an impressive armour protected entrance. To understand why the Germans built a line here one needs to know something about the area. Masuria, in Polish and German respectively, Masury and Masuren is an area in the northeast of Poland. It was part of the former German province of East-Prussia which led the creation of the German Empire in 1871. A large part of the population were ethnic Poles but the majority of them regarded themselves as East-Prussians. The main language however became German and Germanisation of the people was done through education. Teaching of the Polish language at school was forbidden after 1872. 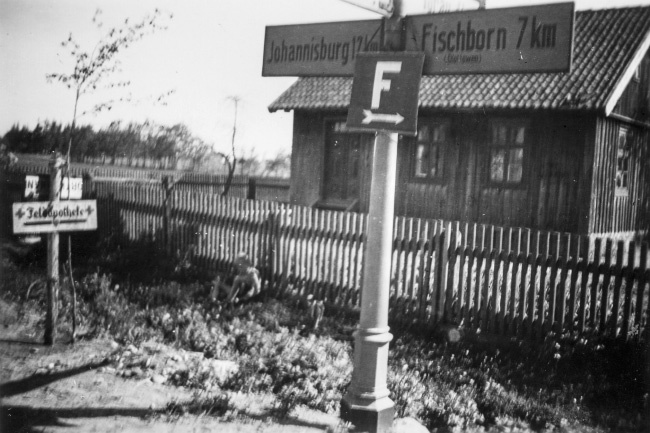 From 1933 on, during the National Socialistic government, all Polish activities were banned and even all names of cities and villages were changed from Old Prussian and Polish to newly-created German names. East-Prussia consisted of a small part of todays Lithuania, Russia's Kaliningrad Oblast and Masuria. It bordered to Russia, a worldpower and one of Germany's biggest enemies. After the invasion and division of Poland in 1939 the USSR came even closer. In 1940 a defenceline along East-Prussia's north and eastern border was built. The so-called Grenzstellungen were divided in three Festung Dienststellen: Königsberg (Kaliningrad), Lötzen (Giżycko) and Allenstein (Olsztyn). The Masurische Grenzstellung is part of Fest.Dst. Lötzen. The interesting thing about this area is that modern Regelbauten from the 100 and 500 series were also brought to this area of the Reich. And because this area didn't urbanise like the Westwall area we can still find a lot of rare bunkers and armoured parts.